Every year once the Fellowship starts, we get the Fellows together to give them the opportunity to learn about the different parts of the Institute (Training, Community, the Research Software Group, Policy, Communications and the Directorate) so they can better understand how we operate and how to interact with us to produce a good working relationship and better outcomes for their Fellowship. 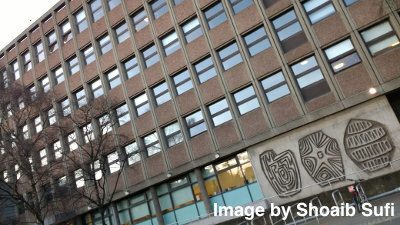 This year we were in the lovely city of Edinburgh at Charteris Land, University of Edinburgh. 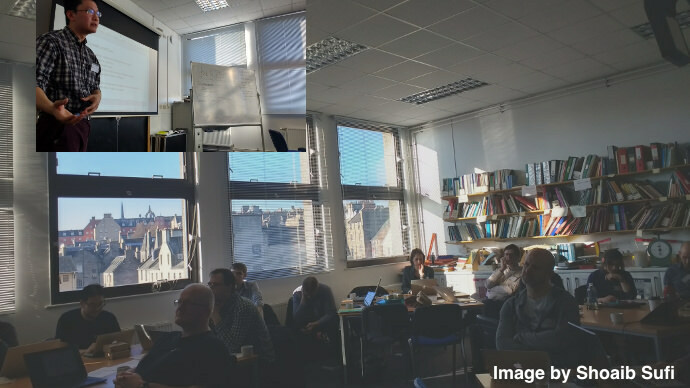 The Institute is headquartered in Edinburgh and it is where three of the new Institute 2017 Fellows are based, making it an ideal location for holding the inaugural. With 18 new Fellows, 14 were there in person, two connected via Skype, one sent a video and only one could not be involved. The Institute Director, Neil Chue Hong gave an introduction to the Institute, its teams and how it operates; he highlighted Fellows as catalysts for promoting better research software practice. Shoaib Sufi (me! ), the Community Lead talking, then spoke on what was in scope for the Fellowship, how we try to help fellows by connecting them to others in the community, iterating their ideas with them and how Fellows have acted as reviewers for our Open Call, Fellowship Programme and represented us in other capacities. Fellows really are one of the team! Aleksandra Nenadic introduced the Training team and talked about Software and Data Carpentry, how successful it was and how they could get involved. Steve Crouch joined us via Skype and presented the work of the Research Software Group and spoke about how the Fellows could get involved as reviewers and promote the Open Call to colleagues. Deputy Director Simon Hettrick (also via Skype) then talked about his transformation from laser scientist (dangerous!) to social scientist (very dangerous!) and how questions about the research software community drive the team, with the initial answer around how important software is to research in the UK being the path to other enquiries by the Policy team. Simon highlighted the establishment of the Research Software Engineer community as one of the big successes of the team, and also briefly covered the establishment and success of the Institute blog and the wider Communications team. The Fellows then were given the opportunity (and seven minutes) to spoke about their plans for Fellowship. This allowed them to present updated plans (to those at selection), get feedback from other Fellows and Institute staff and open up opportunities for collaboration with other fellows. The themes of the Fellows plans were broadly captured into a number of clusters: raising the profile of software locally, getting software sustainability on to existing agendas, increasing ‘remote’ participation in projects and improving the practice of publishing code. These clusters helped group the Fellows for the afternoon’s speed blogging activity. A brisk walk and a warm lunch later, it was time to get the last few updates of plans before we moved onto the discussion and speed blogging. Rather than blogging about topics on research software, the blogs were focused on what the clusters of Fellows were planning to do for their domains or institutes. They are currently a work in progress and will be published in the coming weeks. They’re all set to be excellent pieces of writing and give indications of activities to come. We then had a session run by Institute project officer Giacomo Peru, who went through the perils of processing Fellows events claims, some of the common problems were covered such as the need to actually send receipts that match the electronic scans! The smooth operations of reimbursements are actually central to the smooth running of the Fellowship programme so covering this at this stage should make things easier for all involved. Once Fellows have their Fellowship, we just don’t hand over the money (they might run! Just kidding!). To access their money, they have to raise an event request which is approved and then they can claim but they also need to submit a blog post draft. This process uses a combination of forms and emails at the moment.To make life more integrated we (mainly Raniere Silva) have been developing an application which ties all of this together making it easier for Fellows and Institute staff to run the request/claim/blog cycle of Fellowship programme activities. It will make it easier for Fellows to see the official record of what activities they’ve done and what is in progress, as well as how much money they have left to spend (a common request). The system is called LowFAT (Low effort Fellowship Administration Tool) and it’s opensource and available on GitHub. If you’re trying to do something similar and it meets you needs then we would like to hear how you are using it - pull requests welcome! Raniere presented this along with Giacomo to the new Fellows as a ‘coming soon’. We often request feedback for event and the inaugural was no different—those attending rated it 4.5/5 for usefulness (8 responses out of 22 attending) and gave their suggestions for making next year’s event even better. Fellows went away with an improved understanding of the Institute, tweaked their plans, got post-event feedback from some of the Institute staff and also found partners for collaborating on things they would like to do as Fellows. All in one working day! We are confident in asserting that there are many good things to look forward to from Fellows 2017 and you will no doubt hear about them in our newsletter and read about them on our blog. Fellows and the Institute staffers are a friendly and collaborative bunch. If you feel there are natural synergies with your plans don’t hesitate to reach out to us. We often get asked how we do things, this was the first time we allowed remote participation via Skype for Fellows and some of the Institute Staff. We used a wide angle webcam with a field of view of 120 degrees to allow those online to see more of the room. The only downside to the webcam was manual focus but this only required one time setup for the call, a small price to pay for the ‘being there’ feel for remote participants. When choosing a webcam we recommend choosing one that adheres to the UVC specification; this makes it plug and play on Windows and Mac machines. We used a Jabra speaker that was loud and clear to hear from and picked up things well when those presenting were nearby; perhaps having it better located (using a USB extension), using Bluetooth or better still a mobile microphone might be a better way, in the future, to allow remote participants to hear the local speakers and the local questions/discussions more clearly. We requested slides before the day, they arrived in many different format, pdf, pptx, google slides and slides.com (which is based on reveal.js). We shared the screen from the local machine to make it easier to allow remote participants to see what others were seeing locally. The most effective way of showing slides remotely was using slides.com. Their presenter function allowed us to load the presentation locally and the remote presenter to control slide transition—it worked really well. With different formats of presentation, lack of slide forwarding dongle, Skype screen sharing, reminding people where to stand for the microphone, requesting remote people to mute and multiple participants, it required one person full time (almost) to run the infrastructure and deal with problems as they arose (e.g. can people speaker nearer the mic). So if you are thinking of doing this then just be aware that the person running the workshop can’t run this side of things and you will need a dedicated person to do this as well as a dedicated machine to run this upon. If you have any tips from your experiences, please add them to the comments below or get in touch.